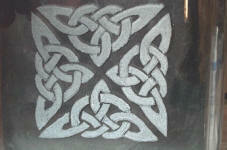 We have a new twist to the way prizes for the Endowment Fund Drawing will be awarded. In the past, all the tickets were dumped into a single hopper and all tickets were drawn from there. Doing this sometimes produced a large number of winners for ticket holders in one federation and perhaps none for another. This year, we're going to ensure that at least one prize is awarded to someone in each of our seven federations! Here's our plan. Tickets sold by each of the regional federation representatives will be held apart from all the others until we make the drawings on Saturday, August 1 during the AFMS/NFMS Convention in Billings, MT. We'll start the drawing by randomly pulling one ticket from each of the regional federation submissions. That way, each federation will have at least one prize winner. After the first seven prizes are drawn, we'll dump all the remaining tickets together in a huge hopper, mix them thoroughly and proceed to draw tickets for the remaining prizes. Another new twist.... We're going to number each of the prizes as we've always done., but this time, after all the winning tickets have been drawn, we'll put them in a small container and select them again....the first ticket drawn would receive prize #1, second ticket, #2 etc. In order to be sure that you have a better chance of winning, don’t send money to me for tickets. Instead, send for tickets from your regional committee member so you can get in on the regional drawing. This new idea has been suggested by a number of former and present regional committee people and we'll see how it works this year. As in previous years, you will be able to purchase tickets at the show itself through Saturday morning. We'll hold the drawings on Saturday afternoon, possibly right after the Single Stone Auction. We'll announce the winners during the Awards Banquet on Saturday evening and of course via the AFMS Newsletter. 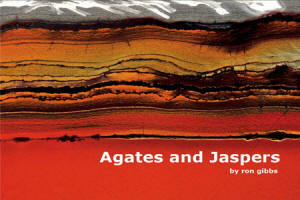 We do have prizes coming in including faceted stones, a meteorite and an intarsia. 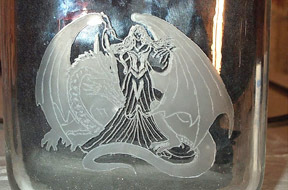 Here's a picture of one new prize that's been added to the engraved vase we featured last month. Tickets are $5 each or 5 for $20 and can be purchased from your regional federation representative. See last month’s AFMS Newsletter (or <www.amfed.org>) for their addresses and emails. If you have a question, or wish to donate a prize, contact me at: <beauholland centurytel.net> or <shirleyleeson cox.net> or write me at PO Box 23, Tendoy, ID 83468. Prize #4: The item is from: David Gheesling and his FALLING ROCKS collection (www.fallingrocks.com). It is valued at $125.00. 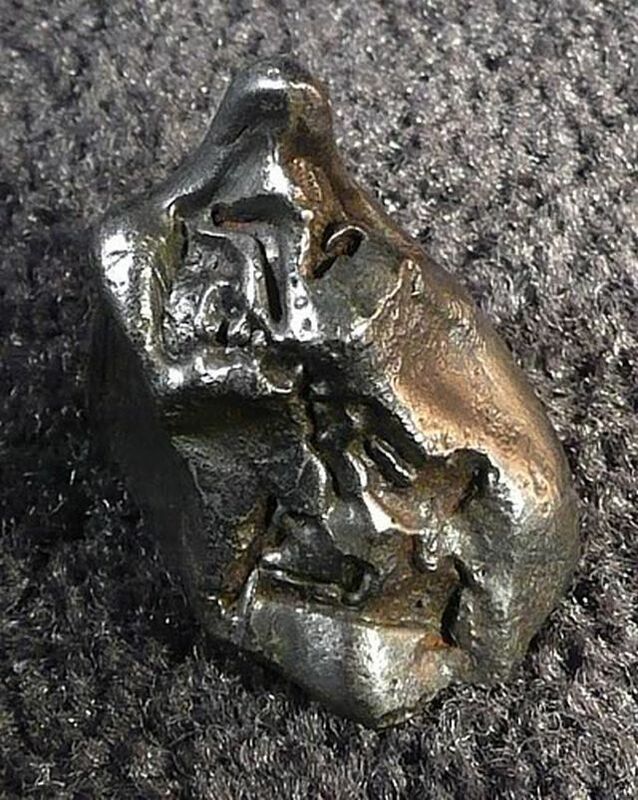 Here is the description: Sikhote-Alin Coarsest Octahedrite Iron Meteorite 64.7 gram complete individual Witnessed Fall: February 12, 1947 Maritime Territory, Eastern Siberia Total Known Weight = 23,000 kilograms Prize #5: This lovely Brazilian agate slab is set in a custom crafter wood stand. 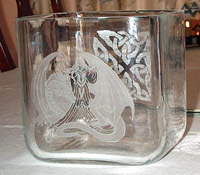 Designed and made by 2008 EFMLS President Ellery Borow, the slab is translucent. When the lighting is right, it looks like you can see through the slab but what you are seeing is a reflection of the curved wood at the front of the base. Estimated value: $150. 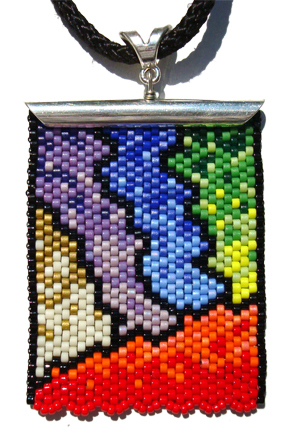 Prize #6: this beautiful intarsia Bola is hand crafted by Jerry Blimka from the Hells Canyon Gem Club, Lewiston Idaho. Jerry is a well known artist in the Northwest. His work can be seen at many of the shows. Last year in Ontario, Oregon at the NFMS show he was awarded the Master trophy for Jewelry Intarsia. 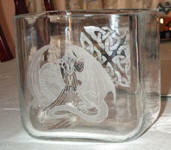 Each of his pieces is a signed and numbered collector’s item. His work will be on display at the AFMS/NFMS Billings, Montana show this year. 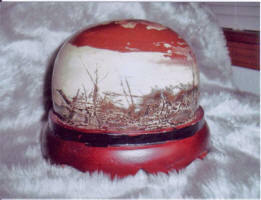 The piece shows the 3D dimensions of his work. Set in Sterling Silver and valued at $850. Prize #7: An oval carving of calcite with quartz and magnetite dendrites was donated by James Gaddey of Joplin, MO and is valued at $115. 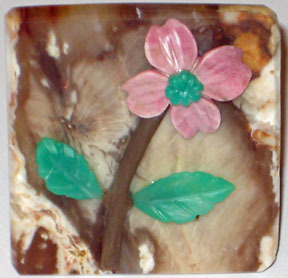 The flowers are rhodonite, the flower center and leaves are chrysoprase, the stem is petrified wood and it’s mounted on a piece of petrified wood from the area near his home. The estimated value is $450. and the size is 1 ¾ in x 1 ¾ in square. 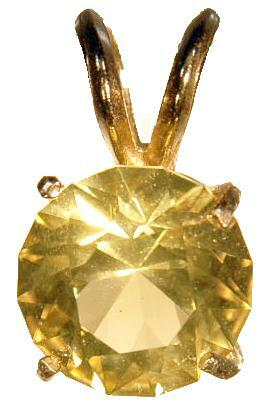 Prize #9: A faceted 10mm lemon citrine set in a 14k gold pendant. 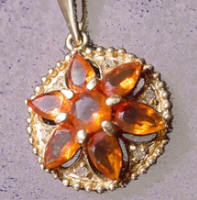 Faceted by EFMLS and AFMS past president Steve Weinberger, the pendant has an estimated value of $125. Chondrite (n) A type of meteorite containing mineral spheres called chondrules. Most Chondrites are believed to originate in the asteroids that orbit the Sun between Jupiter and Mars. 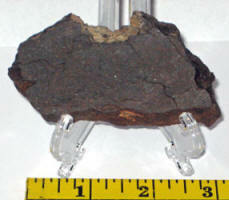 Chondrites contain between 2 and 21 percent iron-nickel metal. Addition information accompanies the specimen. It is a slab and is about 5/8 inch thick. 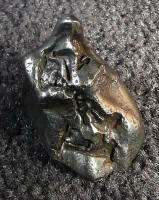 The specimen is 55 grams in weight and has an estimated value is $100. Donated by Carl Shugart, San Diego Mineral & Gem Society Prize #11: Multi-color Jadeite - Guatemala, Sterling Silver Pendant. 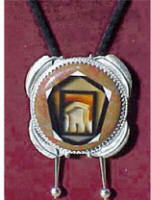 The Pendant that was donated by the Dallas Gem and Mineral Society, Dallas, Texas. It has a retail value of $75.00. 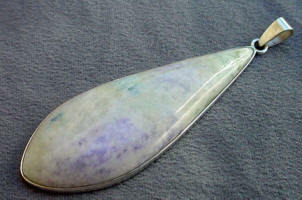 Prize #12: The Pendant is from Jennifer Rhodes, Reno Gem & Mineral Society. 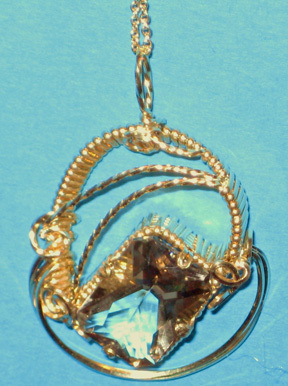 Wirewrapped original, with Petersen Mountain Smoky Quartz, Nevada. The wirewrap is gold filled. 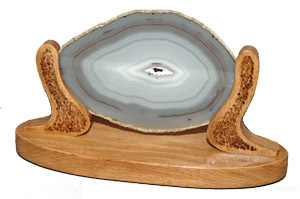 Prize #14: Spectacular dolphin carving. 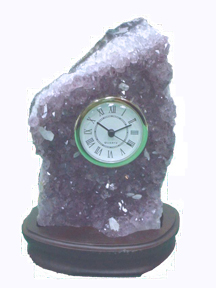 The smoky quartz dolphins are riding on a milky quartz wave. The two dolphins are roughly 2 inches long riding on a wave. The total size is 2 1/2 inches by 3 inches. Created by master carver Kenneth Neaves of Lansing, NC, the piece has an estimated value of $1,200. 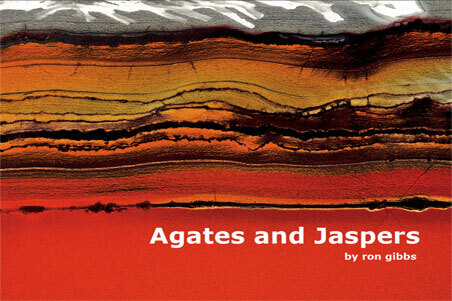 Prize #15 & #16: Two copies of a brand new book on agates and jasper written by Ron Gibbs, the book provides an introduction to the genesis and structural characteristics of agates and jaspers. Included are numerous macro and micro photographs. The retail price of the book is $40.00 and each copy will be awarded as a separate prize. 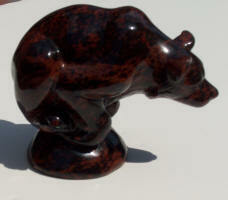 Prize #17: The sculptured bear was donated by Larry Costigan, Costigan’s Minerals, Newport, MN. The value of this sculpture is $125. This bear was sculpted and polished from mahogany obsidian in Mexico. It stands 2½ inches high and is 3 inches from nose to tail. It appears to be a bear poised on a rock ready to lunge at a passing salmon. It would make a great knick-knack or paper weight.